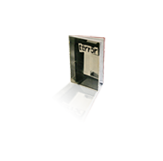 229 x 152 mm; 78 pp. Printed offset on an office rotary press by Dennis Marriner. Double-folded paper covers, with orange-red endpapers; Chinese folded, perfect bound. 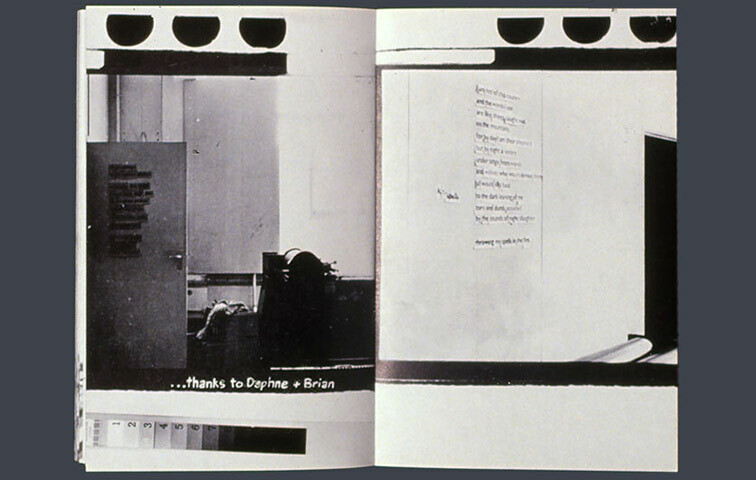 Disliking at the time both lithography and photography, I attempted a book using both: an act of positive aggression. 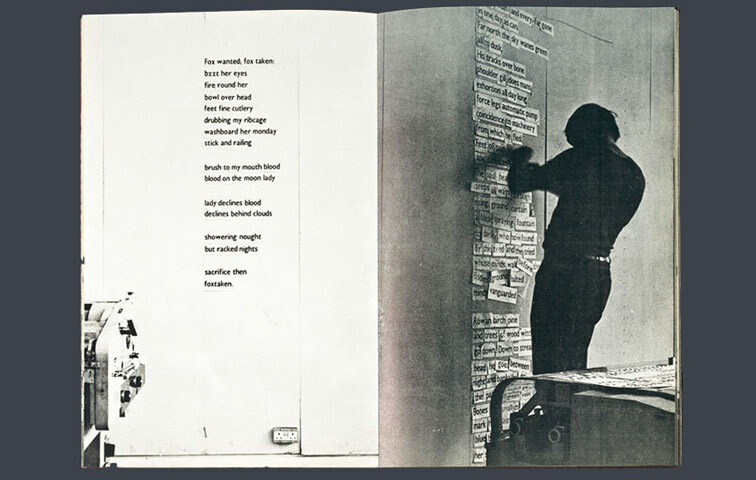 The printing room became a theatre – the wall, the machinery, the maker and supporting cast all played the book while figuring in its frame. 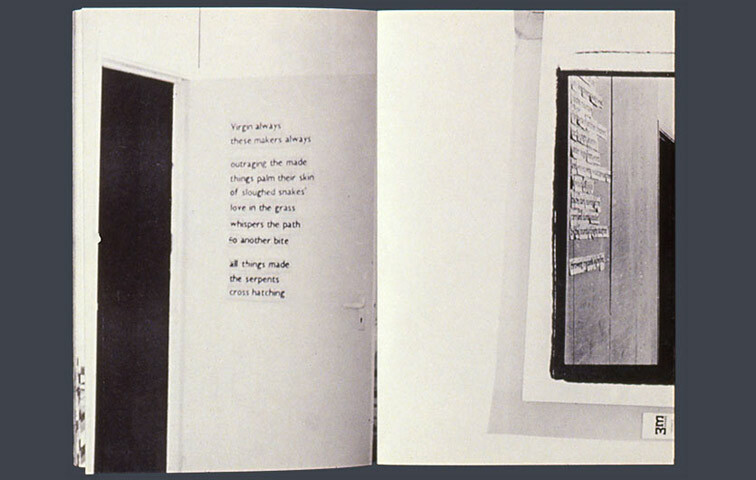 I set the pages as a window to the camera lens, making a wall be a page; hoping to make the page surface ambiguous. 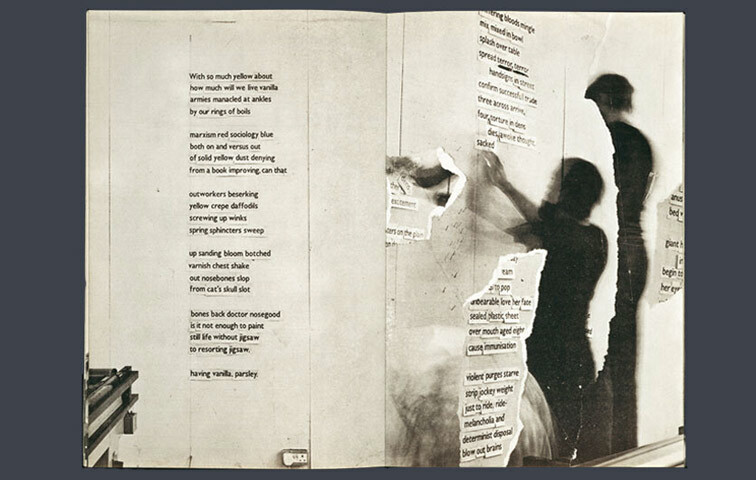 To that end I accumulated poems on a wall from words printed by woodletter. This required a severe, formal procedure. Woodletters are by nature big and any font will hold very few words for printing before they must be put back in their case for resetting. Therefore the exact number of times any word may appear on any page of the book had to be calculated as a vocabulary both of words and of their frequency of use. Thereafter sheets were printed that optimised the number of words from that vocabulary, and the sheet proofed the number of times required by the most-used word on that sheet. (This produced bizarre conjunctions of words; almost-poetry by number, almost-poetry by constraint.) 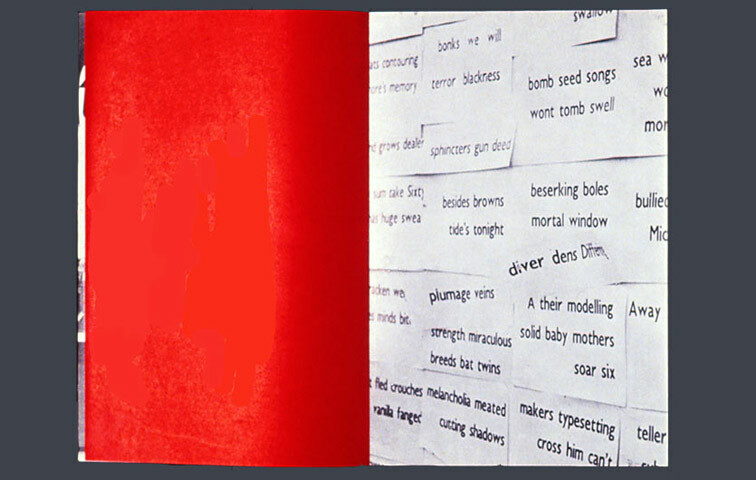 With all of the vocabulary printed, each poem was assembled from the words released from the cut-up sheets. Words were aligned to lines of cotton thread pinned to the wall. 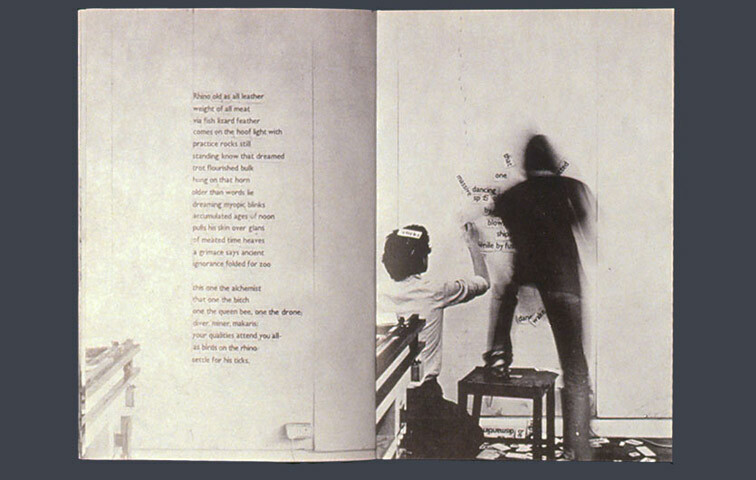 The distance and angle of the camera to the wall (or page surface) was carefully controlled. 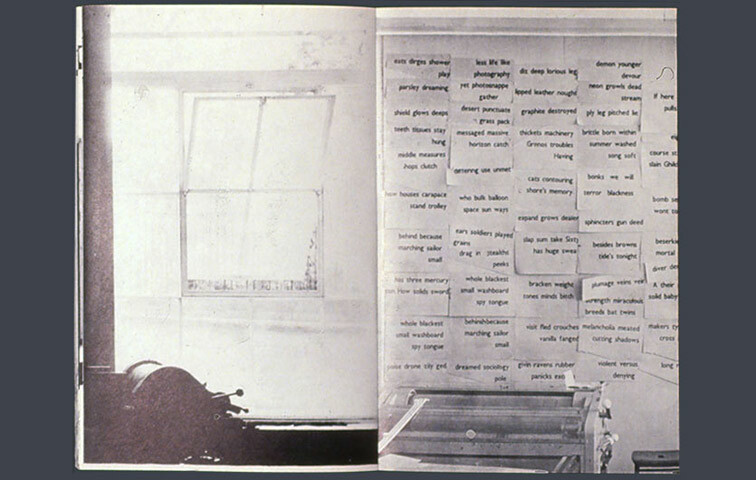 The cotton and the pins were left on the wall as part of the image. These arrangements were photographed at an angle during that construction on a right-hand page, and on the following left-hand page fully frontal and finished. There was a certain amount of visual drama; a rhythmic performance became part of the doing. That rhythm of working informed this book and many of the later works. 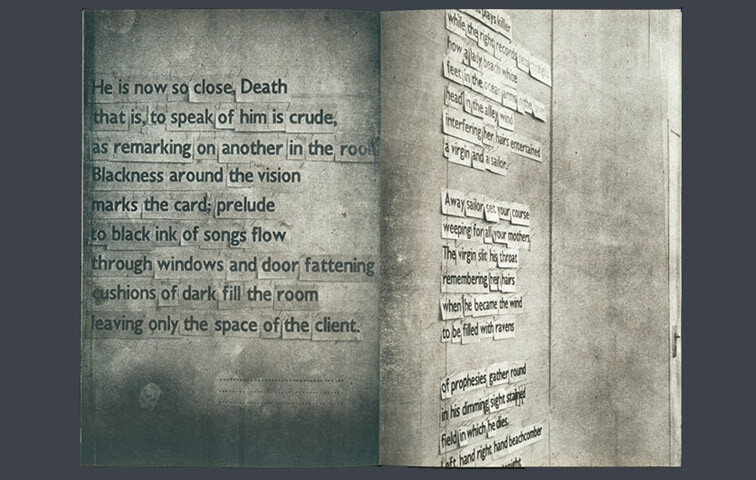 The poetry of this book was written in a time of personal troubles: a redefining of myself as a designer who produces forms more common to the artist, while at the same time tracking my father’s eventually fatal sickness. 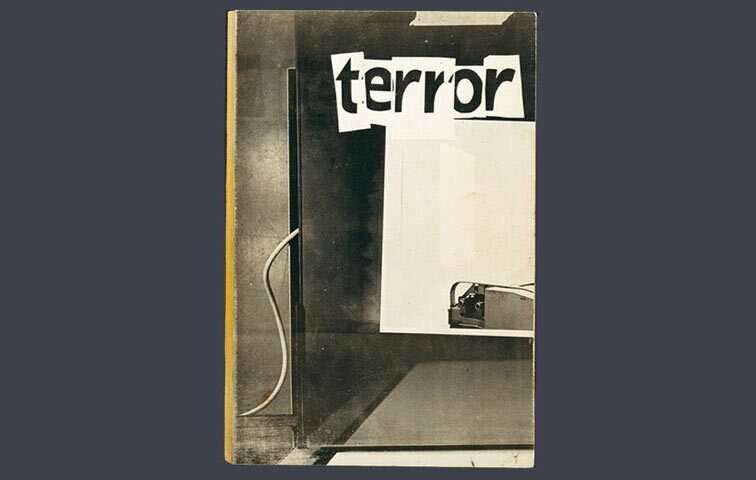 Randomising manoeuvres in the visual reflect the broken poetics of the words; Terror at the front cover, Terror at the back. ‘Who or what makes poetry? Is it the poet or the words, man or the machine? 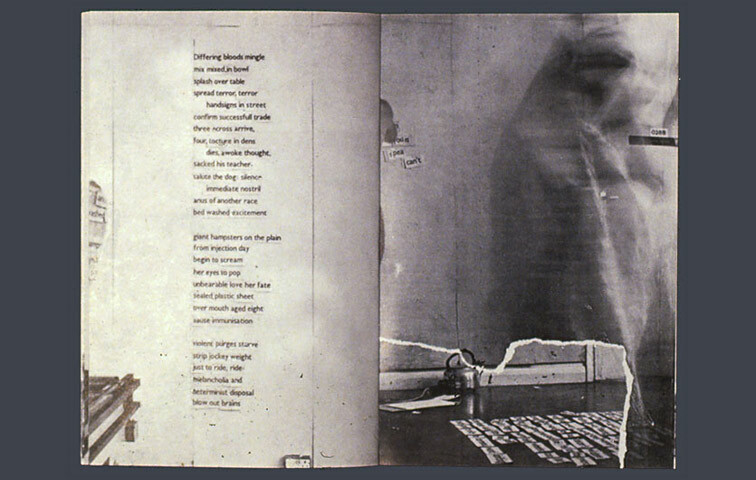 The process of printing gives the words physical presence. In a sea of words men and women fish out a few. They are word-hangers who put words together on the wall. With the look of a prison guard, the machine is the strong authoritative presence, an observer in the foreground whose quizzical countenance looks out at the reader from almost every page. The banal interior setting points to the importance of process. The presence of the printer recedes and lets the machine have its way. The work is a collaboration with another mentality whose cast is different from human intelligence. This is a punk book with rough style and tough demeanour that questions authority. Fuelled by a rebellious attitude toward literature, the book has the strong thrust of a direct, rude gesture.